The Camden Highball (Episode 9): Greetings from Norfolk! This week’s episode of the Camden Highball (Camden Depot’s weekly podcast) comes a week and a day late, but it’s better than no podcast at all! This week, Pat and I talk with Camden Depot’s Joe Reisel about what he’s seen in the Norfolk Tides during the first month of the minor league season. Direct Link to Article –> The Camden Highball: Greetings from Norfolk! Who is the Most Clutch Oriole? The following post was written by Doug Nickerson as a guest post for Orioles Proving Ground. Nickerson grew up as a Red Sox fan on Cape Cod, MA and is looking forward to writing about the Orioles with his knowledge of the AL East from a non-emotional perspective. He moved to the DC area last August, and while he loves the city, he hates humidity and traffic. In watching so many games this year with the purpose of evaluating the players instead of solely enjoying the beauty of the game, many ideas have percolated from the frustrations of watching teams struggle to score, while others seem to score with ease. Now obviously some matchups are lopsided causing teams to either easily run up the score or look helpless at the dish. But the real question I ask myself is, what is the relationship between being good and being able to perform under pressure? On the surface, the Orioles haven’t been able to turn it on when it counts this year compared to last year, especially when considering their record in 1 run games has gone from 29-9 in 2012 to 14-22 this year. What’s the cause of this? Is it purely luck? Did last year’s team have nerves of steel compared to this year or is it just the law of averages taking its course? To compare this year and last year, I needed to look at clutch stats. The easiest to compare is baseball-reference.com’s “clutch” stat, which is based on its win probability stat and average leverage index. The clutch stat normalizes these numbers so that a player with a clutch rating of 0 is an average player and a positive or negative rating is more or less clutch, respectively. Let’s take a look at the offensive numbers (I included guys with at least 45 ABs for the season). Now, as expected, Chris Davis is the most clutch player on the 2013 team and that’s a reason why he is rightfully in the MVP race. The surprising results of this stat is that 3 regulars are considered the most clutch hitters on the team (Davis, Jones, Markakis) and 3 regulars are considered to wilt during the big moments (McLouth, Wieters, Hardy) for the 2013 season. When compared to last year’s team, only 2 players that got regular starts (Andino and Betemit with over 350 ABs each) had a negative rating. This could be a potential reason for the drastic change in their record in 1 run games. However, now the question arises as to how much are they affected by the big situation? How much does 0.1 clutch point reflect into a player’s OBP in high leverage situations? Is it substantial, where all hope is lost if there are two outs, man on third, and the game is tied in the late innings? I find the clutch stat to be interesting but it leads me to more questions. Now let’s take a look at each players OBP in different leverage situations to see if there is anything substantial. I used OBP as a comparison, to measure the ability to keep the inning alive as critical to increasing your opportunity to score runs. It is also a clean stat that is taken directly from the field and not manipulated in any way, unlike win probability, runs created, etc. From the chart, it can be seen that Nick Markakis is the most clutch batter on the team in getting on base in high pressure situations this year. He also has nerves of steel as his OBP rises almost 100 points from his average when he is in a high leverage situation. 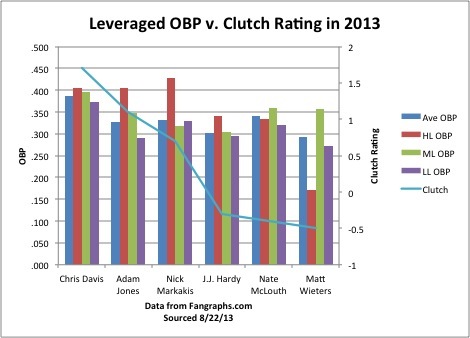 Matt Wieters appears to be deserving of his low clutch rating due to his drastically low OBP in high leverage situations. However, the same can’t be said for J.J. Hardy or Nate McLouth. Both are roughly the same or above their 2013 OBP average in high leverage situations, making them fairly clutch relative to themselves in low-pressure situations. Five of six regular Orioles perform better when the pressure is on them to succeed. This causes me to believe that the clutch rating stat has to be taken with a grain of salt when looking for it to translate onto the field. With this in mind, I’ll look into the team’s clutch pitching numbers with my next post to see how the 2013 team is comparing to last year’s. Adam Jones: Too Good to be True? Many Orioles have gotten off to a great start in 2013. Last week we took a look at the hot start of Chris Davis, to determine if his success was due to good luck, or a change in approach. This week, we’ll take a gander (thank you Microsoft Word thesaurus! )* at the hot start for Adam Jones, and see if we can answer the same question. As of May 6, Adam Jones is the owner of a very healthy triple slash line, which is sitting at .331/.360/.519 (AVG/OBP/SLG). All of three are above the levels of his breakout 2012 season, when those statistics were also career highs. Despite the .519 slugging percentage, he is hitting for slightly less power this year compared to less, as his ISO is currently 0.030 lower than it was in 2012. Still, between last year and 2013’s great start, the Orioles front office and its fans are feeling pretty good about that extension Jones signed last year to stay with the team through 2018. Similar to Davis, the first thing that jumps out about Adam Jones’ season so far is his extremely high BABIP, which is currently at .400 (career .320 BABIP), and ranked as the 7th highest in all of baseball (Chris Davis is ranked 17th). While BABIP can be an indicator of good or bad luck, luck is not the only reason for a high or low BABIP. As previously discussed in the Davis post, hitters who are fast and hit line drives have a better chance to maintain high BABIP’s. Jones certainly has above average speed and his line drive rate is currently 3.3% above his career average. However his 2013 LD% is basically the same as it was last year, when his BABIP was .313. One reason being touted for Jones’ great start to the season has been his improvement when hitting with two strikes. The numbers back this up, as Jones is hitting .302/.333/.476 with two strikes in 66 PA’s. He also has an ABSURD .545 BABIP with two strikes. Read that last sentence again. In a count where the pitcher likely has a huge advantage, Jones getting hits on over half of the balls he puts in play. In his career, Jones’ numbers with two strikes look a lot different, with a line of .211/.257/.329 and a BABIP of .331. Even Chris Davis has a.228/.297/.491 line, with a BABIP of .409, is not even close to Jones’ two strike numbers in 2013. While there is no reason why Jones will keep up his pace with two strikes, maybe he has changed his approach at the plate with two strikes through a shortened swing, better strikezone awareness, etc. I have admittedly not watched enough Orioles games this year to make that claim one way or another, but the plate discipline numbers do not back this up. Cue the table! Jones is basically right around his career averages in the above plate discipline categories. These numbers in addition to his current walk and strikeout rates don’t really show any sort of change in approach. 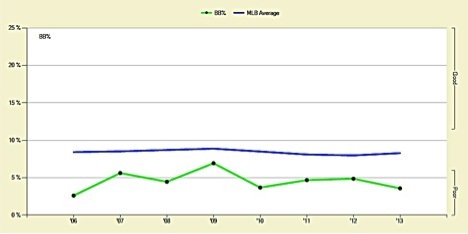 Jones has never been known to take a lot of walks, but so far in 2013, both rates are trending in the wrong direction (the blue line indicates league average). Any idea who those players might be? Hint: it’s probably not who you were hoping for. Player A is Chris Johnson, third baseman for the Atlanta Braves. If his name sounds familiar, he was part of the package Arizona sent to the Braves with Justin Upton this past offseason. Over the course of his career (1,400+ PA’s), he’s basically been your average hitter, with a career triple slash line (AVG/OBP/SLG) of .279/.318/.432. Player B is Nick Hundley, catcher for the San Diego Padres. Hundley has almost 1,500 major league PA’s in his career and has been a below average hitter, with a .242/.300/.397 line. Player C is Starling Marte, left fielder for the Pittsburgh Pirates. Marte has accumulated roughly a half season of PA’s in his two years in the majors and was one of the Pirates top prospects as recently as last year. Scouts love his potential, but a lot believe he will never learn the plate discipline needed to reach it. I don’t believe that it is unrealistic to say that Marte would be fortunate if his ceiling is Adam Jones type production, but he has a long road to get there. If you don’t feel good about these players continuing to produce at those levels for the rest of the year, you shouldn’t, because it’s not likely that they will. Unfortunately, the same can be said of Jones, especially since his plate discipline numbers indicate that his approach at the plate has not been any different this year than in previous years. At some point, Jones’ balls in play will stop finding holes (especially with two strikes), and his numbers will regress to last year’s levels, or even closer to his career levels.